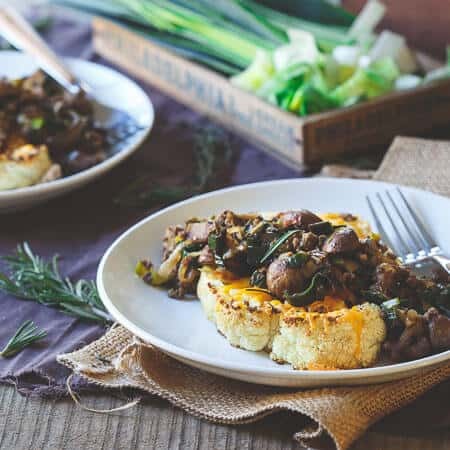 Thick cut and hearty cauliflower steaks are topped with melted cheddar and a savory bison, crimini mushroom and leek saute – total comfort food! Have you guys gotten on the cauliflower steak bandwagon yet? I feel like I just got into it being mashed and riced and now there’s another thing to test out with this magical white vegetable – steaks. Hi, I sound like I’m 75 and using a computer for the first time. Technology…vegetables…same thing. Or not. It took me awhile after this making steak with cauliflower thing got popular this past year to give it a shot. But the first time I tried it, I had to agree it’s totally a brilliant way to get a super hearty vibe from a vegetable. Check out this buffalo cauliflower steak recipe for another way to do them! It’s no comparison to porterhouse steak or anything but it’s deliciously filling and satisfying in its own way. How Do You Cut Cauliflower Steaks? The trick to getting nice steaks that hold together is leaving the stem intact. You can trim a small part off the bottom if it looks brown but leave that core/stem otherwise intact. You then slice into about 1″ thick pieces going through the core. The end slices outside of the core will just fall off into florets but the center will give you nice “steaks” of cauliflower. You can usually get 3 or 4 good thick slices per head of cauliflower depending on the size. Don’t discard those florets from the sides that fall off either! Just roast them along with the steaks and enjoy them in another meal or on the side. If you remember these Mexican stuffed onions from last year, you might remember they were part of the Chopped At Home Challenge that Sargento® hosted. 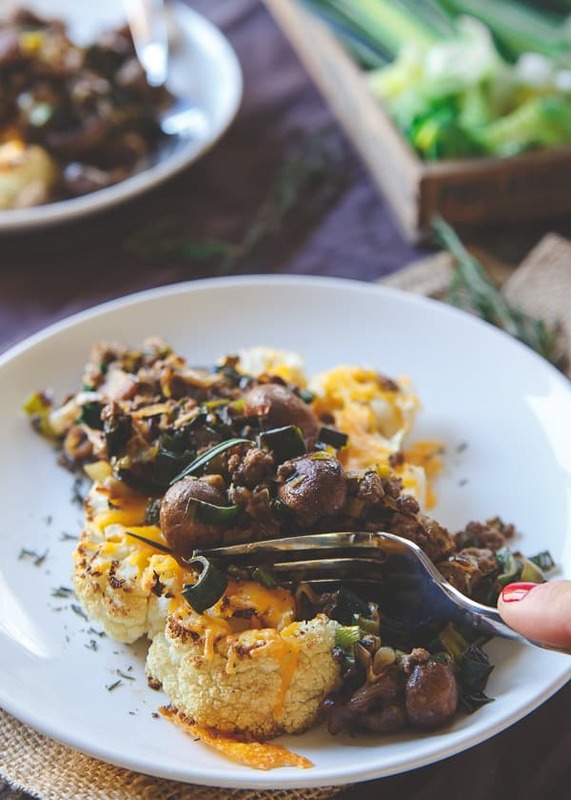 Well, these bison cheddar cauliflower steaks are this year’s entry of mine for the challenge! This is where my brain took me when I was given Sargento sharp cheddar shredded cheese (love that it’s 100% real cheese AND I don’t need to pull out my grating box – or clean it! 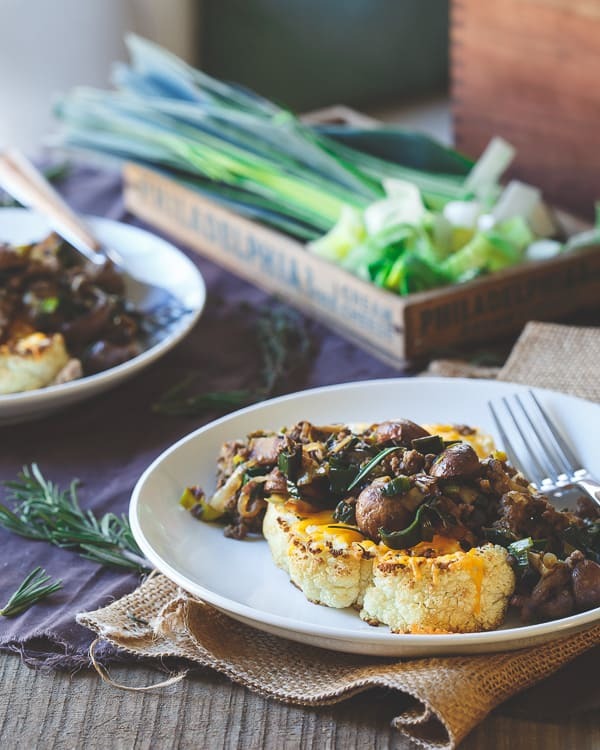 ), cauliflower, leeks and crimini mushrooms to create a comfort food inspired recipe. I’ve been loving on bison this winter as a leaner option for hearty meals (like bison burgers!). Paired up with mushrooms, leeks and don’t freak out at this one, but cinnamon and nutmeg (it works, trust me!) too it makes for the perfect accompaniment to cheddar cheese topped roasted cauliflower steaks. One bite in and I’m pretty sure this one would get me to the next round if I was on the show. Reality is probably more like me freaking out under the time constraints with nothing to show after 30 minutes. Hence why I’m a blogger not a chef. Try one of these cauliflower recipes too: Cheddar Cauliflower Burgers, Brown butter and caramelized onion mashed cauliflower, Buffalo Turkey Cauliflower Skillet or, Roasted Cauliflower Soup. 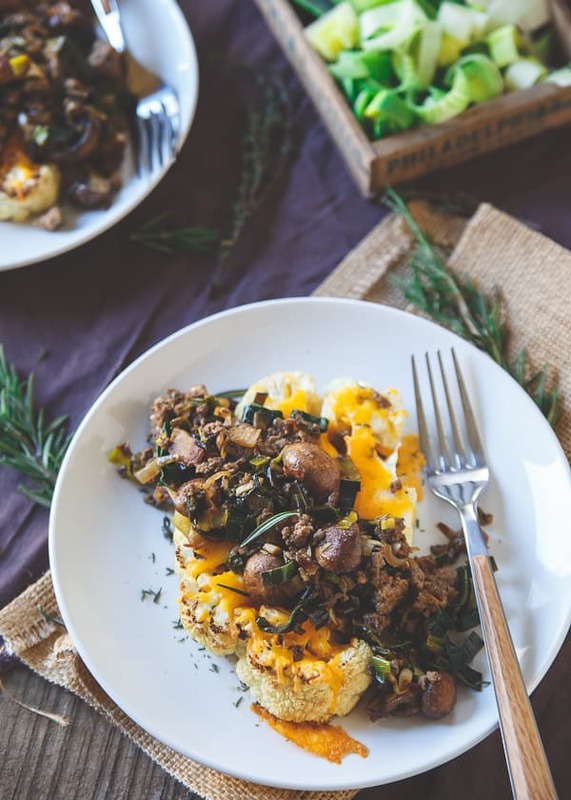 Thick cut and hearty cauliflower steaks are topped with melted cheddar and a savory bison, crimini mushroom and leek saute. It's healthy comfort food heaven. Preheat oven to 375 degrees convection roast if you have that option or 400 degrees regular bake. Grease baking sheet with cooking spray and place cauliflower steaks on the baking sheet. Drizzle cauliflower with the olive oil, season with salt, pepper and the thyme and place into oven to roast for 15-18 minutes until starting to turn golden brown around the edges. Remove from oven, top each steak with the cheddar cheese, return to oven until melted and bubbly, about 3-5 additional minutes. Remove from oven and set aside. While cauliflower roasts, heat a large skillet over medium-high heat. Add bison to the skillet and cook until browned breaking up the meat with a spatula. Drain any excess fat from the pan, transfer the bison to a plate and set aside. In the same pan, add the butter and olive oil. Add the shallot and saute for 1 minute until starting to soften and fragrant. Add the leeks to the pan and cook another 1-2 minutes until starting to soften. Add the mushrooms, give everything a good toss in the pan and let cook without stirring for about 5-7 minutes until mushrooms have given off all their liquid and start to brown. Reduce the heat to medium-low, return the bison to the pan, add the milk, cinnamon, nutmeg, salt and pepper, stir together and let cook another 2-3 minutes until thickened. Plate cauliflower and spoon bison mixture over top. I love this recipe. I’m with you, when the cauliflower steak craze started I was all “it’s not steak”. Ha, I’m such an old fuddy duddy. Now I dig them and this one is delightful. I love that you covered it with bison and cheese. I’d be all over this. I’d probably gobble it up in no time flat. Your photos are gorgeous. I love pinning from your website.